Stock markets around the world are in high-five mode. Investors are doing a happy dance after an uplifting report showed U.S. jobs grew in April and the United Kingdom's election results gave Prime Minister David Cameron and his conservative party a clear victory. 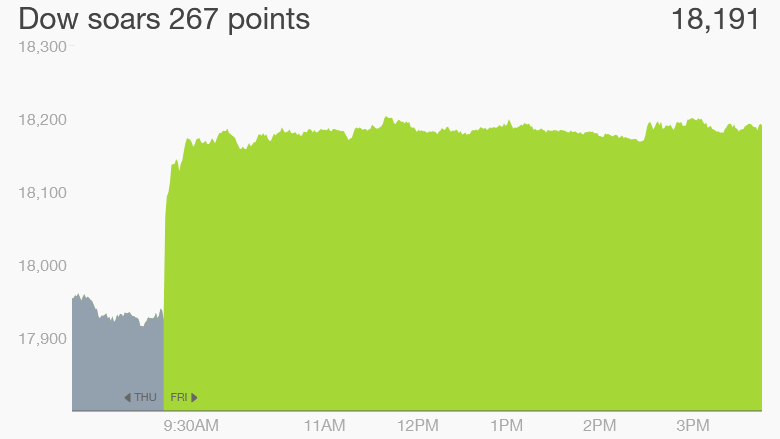 The Dow surged 267 points (nearly 1.5%) in afternoon trading Friday. That's one of the best trading days of the year. The S&P 500 and Nasdaq indexes are also ended more than 1% higher. In fact, all 30 stocks that make up the Dow index finished up Friday, and only about 40 of the 500 American companies in the S&P 500 index ended in the red. The euphoria stems from signs that the U.S. economy is rebounding this spring much like last year. The economy continued to add a very healthy number of jobs -- 223,000 -- in April. Anything over 200,000 is considered robust. The market is also cheering because it's a sign the economy isn't overheating with too much job creation, a worrisome factor for the Federal Reserve. The Fed has strongly hinted that it will raise interest rates from their historic lows at some point in 2015, but that's looking more and more like it's coming later in the year in September rather than June. 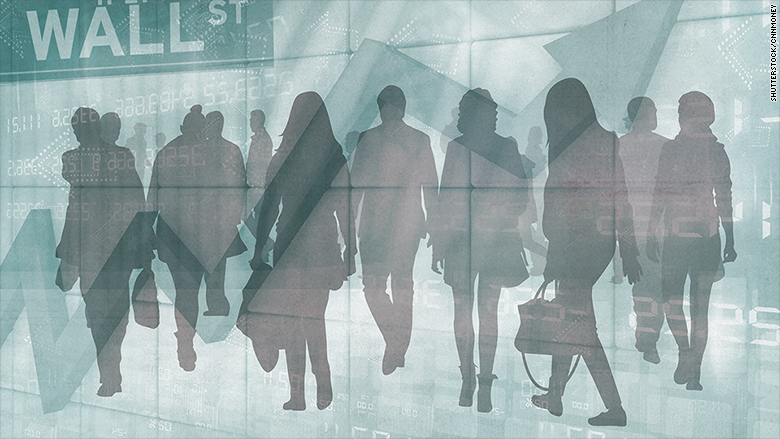 "Today's jobs report was supportive of a continued market run," says Brad McMillan, chief investment officer at Commonwealth Financial Network. "It's just right. It's not too hot, it's not too cold." European markets had an even better day -- the main stock markets in the U.K., Germany and France all chalked up gains of 2%, or higher. The general perception is that Cameron will be better for business. Stocks weren't the only winners. Bonds also rallied around the world. Yields on government bonds in the U.S. and Europe had been moving significantly higher in recent days. But they fell again on Friday. The yield on the 10-year U.S. government bond is now 2.14%. Only a day ago it was above 2.2%. What's next? Going forward, investors will be looking for the U.S. stock market to have a "break out" moment. There haven't been as many record-setting days this year compared to last year. The general consensus is that the big rally is running out of some steam. The bull market is now the third-longest in U.S. history. While markets don't die of old age, the risks are certainly rising, especially as the Fed prepares to raise rates. "It's going to be hard to push [the market] much higher with somewhat of an 'earnings recession' and all of the economic data being pretty neutral," says Randy Frederick, managing director of trading and derivatives for Charles Schwab.